Former Police Chief In S.C. Sentenced To House Arrest Over Unarmed Man's Death : The Two-Way More than a month after his second trial on murder charges ended in a mistrial, former Eutawville, S.C., police chief Richard Combs agreed to plead guilty to misconduct in office Tuesday. 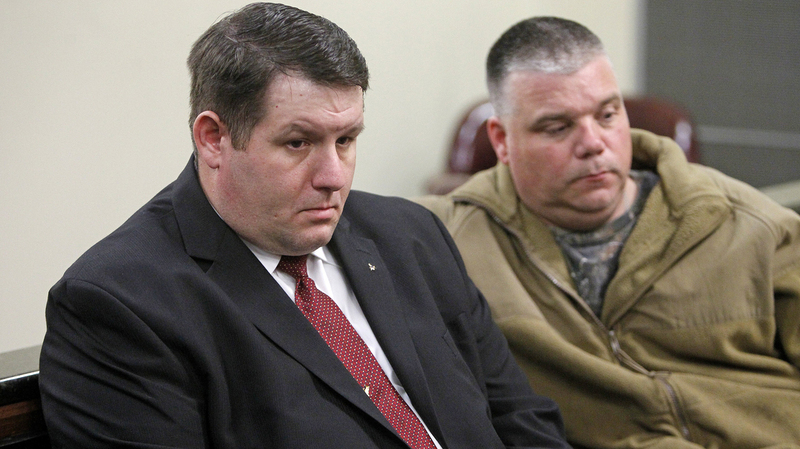 Former Eutawville police Chief Richard Combs (left) agreed to a deal Tuesday in which he'll avoid jail time over the 2011 shooting death of Bernard Bailey. More than a month after his trial on murder charges ended in a mistrial for the second time, former Eutawville, S.C., police Chief Richard Combs has been sentenced to a year of home detention. Combs agreed to plead guilty to misconduct in office Tuesday. Combs, who is white, was the head of the police department in the small town of Eutawville back in May 2011, when he shot and killed 54-year-old Bernard Bailey, who was black, as Bailey tried to drive away from the Eutawville Police Department. Two months before the killing, the pair had what seems to have been their first interaction, when Combs, 38, gave Bailey's daughter a traffic citation. When Bailey later visited the police station to discuss the case, he was killed after Combs revealed he had taken out a warrant for the man's arrest. "Eutawville suspended Combs after the shooting and dismissed him several months later. The town reached a $400,000 wrongful death settlement with Bailey's family. "Eutawville is a town of 300 people 50 miles southeast of Columbia. Combs was the only police officer at the time of the shooting." Murder charges were not brought against Combs until more than three years after Bailey's death. He was indicted last December, after white police officers in New York City and in Missouri were not indicted over the deaths of unarmed black men — Eric Garner and Michael Brown. Despite two mistrials in two different South Carolina cities, prosecutors were set to charge Combs once again, reports local TV station WLTX, which adds that the possibility of a new trial prodded Combs into accepting a deal. "During the traffic stop, Bailey and Combs argued but were far from coming to blows, and prosecutors contended that Bailey was doing what all fathers would do if they could — be present during a traffic stop involving their daughter. Other police on the scene testified that Bailey's conduct did not amount to interference with an officer. "After the traffic stop, without telling Bailey, Combs went to a magistrate and swore out a warrant for obstruction of justice, a charge that carries up to 10 years in prison. "Later, when Bailey went to Town Hall to request a change in the court hearing date on the broken taillight charge because his daughter was away at college, the chief sprung the warrant on him. Bailey, whom witnesses said was stunned, walked out of town hall and went to his truck. Once Bailey was in his truck and was starting to back up, Combs opened the door and tried to turn off the ignition. The two briefly fought, and Combs shot Bailey twice in the chest, prosecutors said."